The Backwoods Engineer: Coming Soon to Your Neighborhood Gun Store: 4473 Burn Parties? Coming Soon to Your Neighborhood Gun Store: 4473 Burn Parties? Ol' Backwoods will never forget when I was a kid in the mid 80's, watching the scene in Red Dawn where the Commie major tells his minions to go to the gun store and get all the Forms 4473. Those are the yellow forms, kept in every gun store for up to 20 years, with a record of who bought what. Look, Ol' Backwoods agrees with many in our 2nd Amendment community that eventually, there will be a confiscation order given by Obama or whatever Progressive succeeds him. They cannot fully implement communism with an armed citizenry, especially one that is continuing to arm itself at a rate of over 16.8 MILLION firearms per year, a rate which is accelerating. That has got to be scaring their tyrannical pants off. They need registration, as a first step. We know what always follows: confiscation, at gunpoint. This burn barrel day -- likely to be held the day after the President signs any new draconian legislation -- will include speeches, public prayers, and the blessing of those who have gathered by ministers, rabbis, and priests. 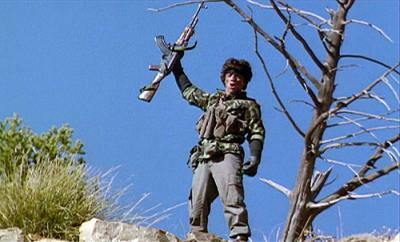 When Ol' Backwoods was a kid, that scene in Red Dawn didn't cause me to fear as much for myself as for others, because I knew my rifle and shotgun were not bought from a gun store, but handed down from my Daddny. Still, I feared for the others whose where. Now, I have 4473's scattered in gun stores here and yon. So, probably, do you. If a registration order comes down, they must be destroyed. This will save lives. In that day, I hope to stand and make a decent account of myself, so that I may not be ashamed in the company of my Revolutionary War ancestors in Glory.